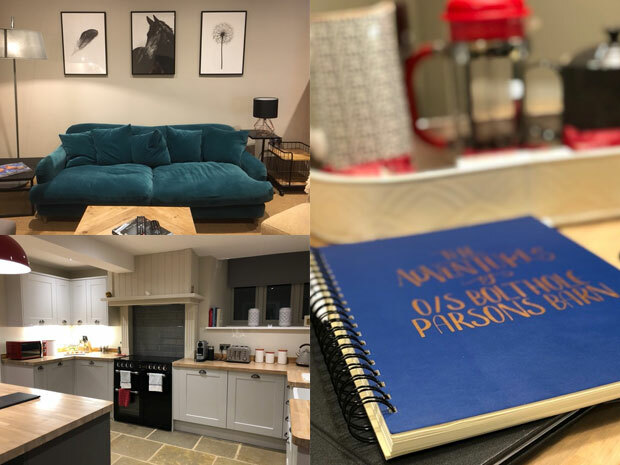 Taking self-catering to a new high, SoGlos was invited to stay the night at The Old Stocks Inn’s Bolt Hole for a getaway that combined a luxury Cotswold hotel stay with all the comforts of home. Nestled in the heart of Stow, is a self-catering cottage like no other. Drenched in contemporary style, modern appliances and yet still maintaining its rustic charm, The Old Stocks’ Bolt Hole provided a luxurious stay we will never forget. If you’re searching for a base to explore the Cotswolds, look no further. We think we’ve found perfection. 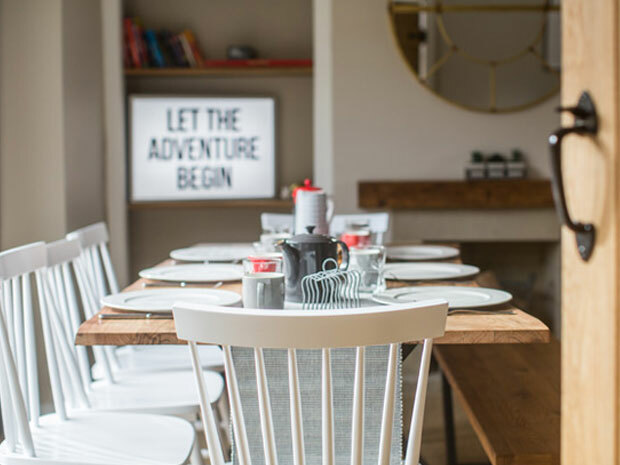 Known for its boutique Scandi-decor, The Old Stocks Inn has made a name for itself as one of the most stylish places to stay in the Cotswolds, and its latest addition – a family-sized holiday cottage known as The Bolt Hole, is no exception. The cottage somehow maintains the feeling of being part of the hotel, despite being 137 steps away (we counted!) and having its own entrance and parking. Greeted with a warm welcome at The Old Stocks reception, our group was shown around The Bolt Hole to a chorus of gasps and wows as we cooed over the incredibly furnished rooms, styled by The Old Stocks’ designer. A far cry from a traditional chocolate box Cotswold cottage. The Bolt Hole combines its charming rustic beams and original stone walls with bold colours and bright open-plan spaces, perfect for socialising. Awaiting our arrival were slices of homemade lemon drizzle cake, bottles of wine chilling in the fridge, locally sourced bread, butter and jam, and a range of soft drinks – already we felt like we’d arrived in the lap of luxury. Traditional flagstone flooring in the hallway led us upstairs to three individually styled bedrooms. A twin room featuring a contemporary nod to Batman, a spacious double with an incredibly inventive headboard, and a master suite best described as the lovechild of Pinterest and Instagram – simply stunning. Providing the perfect environment for a relaxing lie in, catching up on the day’s news and drinking a cup of The Bolt Hole’s Nespresso coffee, each room comprised of spa-style Aromatherapy Associates luxury toiletries, bath robes and slippers, Hypnos mattresses, crisp white Egyptian cotton bed linen, fluffy white towels, and a smart TV with built in Freeview, Netflix and YouTube. The cottage’s modern country kitchen houses everything you could need to cook dinner for a large family, and even provided a range of Tupperware –perfect for taking snacks on a long Cotswold ramble. Every detail in The Bolt Hole has been considered, from its social layout through to a range of cake tins, should you fancy a chilled afternoon of baking! The living room and dining space continued the Scandi-style with its centrepiece teal velvet sofa from homeware brand Loaf. Large enough to comfortably seat three, our group each took turns to be enveloped in its tactile fabric, before quickly googling how much money we’d have to spend to buy one for our own homes! Needless to say, if The Old Stocks ever decides it’s time for a change, The SoGlos team will gladly find space for that gorgeous sofa in our office! In the evening, we enjoyed relaxing in front of the large flat screen television, equipped with a full Sky package, and tucked into festive nibbles, creating a cosy atmosphere, perfectly laid out for a large family or group of friends. Pushing the boundaries of traditional holiday lets, The Old Stocks Bolthole is a cut above any other self-catering accommodation we’ve ever had the pleasure of staying in. Combining the luxury of a boutique hotel stay with all the comforts home is no mean feat, and yet The Bolt Hole has both in spades. Providing a great base for a family trip to explore the Cotswolds, a luxury hen party or weekend away with the girls, or even for a mini-moon following a Cotswold wedding, the property is so incredibly versatile it’s certainly a venue we’ll be recommending to friends and family for years to come. Guests staying at The Bolt Hole are offered breakfast at The Old Stocks Inn on their first morning, as if they were a guest of the hotel. We enjoyed the Old Stocks Cotswold breakfast, including a locally sourced Todenham Manor Farm sausage and bacon, black pudding, tomato, mushroom, beans, and Billy’s free-range egg, which were perfectly poached to our liking. 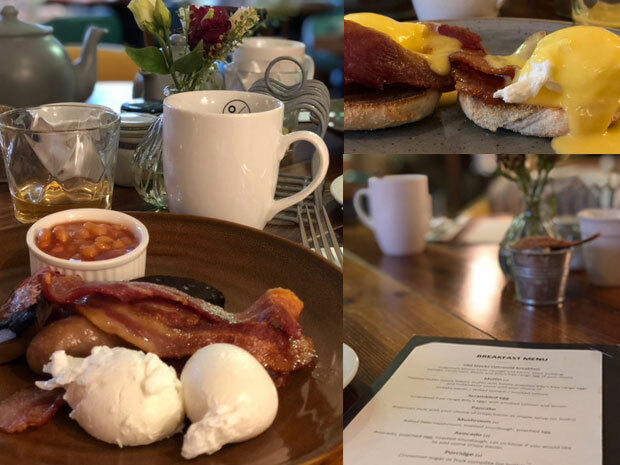 We also tried the muffin option, featuring a Hobbs House bakery muffin, freshly poached local eggs, beautifully crispy streaky bacon and hollandaise sauce. Alongside the cooked option, guests are invited to choose from a continental Cotswold buffet, including locally sourced butter, fresh bread, miniature pastries, fresh meat and cheese, and a range of cereals and spreads. This luxurious breakfast was the perfect end to our stay, setting us up for the day with delicious and filling local produce and incredibly friendly yet professional customer care. 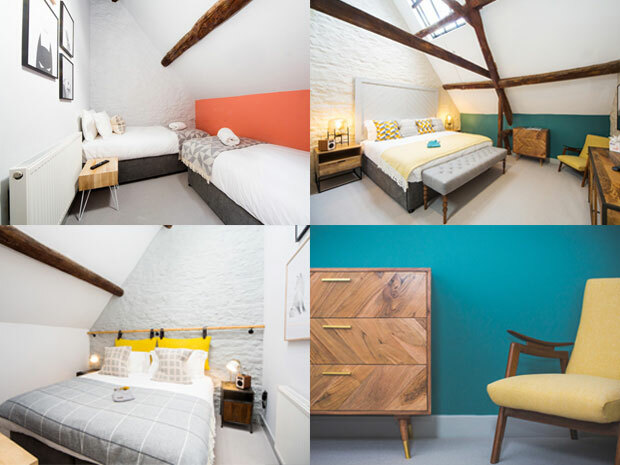 The Bolt Hole sleeps six people across its three bedrooms, so splitting the cost of booking amongst a group of friends or family makes a stay here incredibly good value. The Old Stocks Inn is just a minute’s walk from The Bolt Hole too, which is ideal if you fancy a delicious cocktail or meal in the restaurant, with the added atmosphere of this popular Cotswold inn. For more information, see The Old Stocks Inn, call (01451) 830666 or visit oldstocksinn.com directly.